Vivekananda Kendra Thiruvananthapuram celebrated Universal Brotherhood Day at Swaty Nagar Samskara Varga on 11th Sept 2016. Swami Jnanamayananda from Sri Ramakrishna Mission, Sasthamangalam and Dr.Girija Devi a consultant Ophthalmologist from Sri Ramakrishna Mission Hospital, Sasthamangalam were the chief guests of the day. 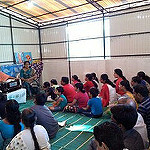 Swamiji gave asheervachana and Dr. Girija Devi gave a brief note on Swami Vivekananda and The significances of the day. Participants from Yoga Varga (Chitra Nagar); Samskara Varga (Swaty Nagar) ; parents; well wishers together made the day memorable with songs, shlokas, Chicago Address ( Malayalam and English), Swamiji’s quotations, ............. etc. About 50 people participated in the celebration.